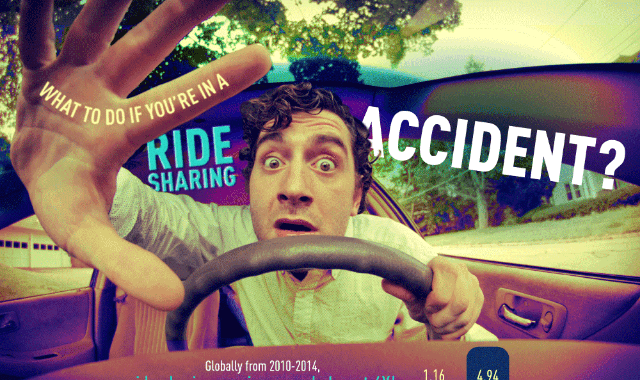 Ridesharing Accident #Infographic ~ Visualistan '+g+"
You download a ride sharing app on your phone. Hailing your first ride is easy, and you start using it more and more often. Then it happens - you’re in the car when your driver is involved in an accident. There are some minor injuries but thankfully everyone walks away. You go to the hospital to get treated, and a few weeks later you get a letter from your health insurance company asking you if you sustained your injuries as a result of an accident. Turns out they want the car insurance to pay for your injuries, but who is responsible, the driver or the ride sharing company? The laws about ride sharing and ride hailing liability differ vastly from state to state and even sometimes within cities. Some cities ban them because of all the unanswered questions about licensing and liability. But these services are still growing, so it’s worthwhile to learn what you should do if you ever find yourself in a ride sharing accident.